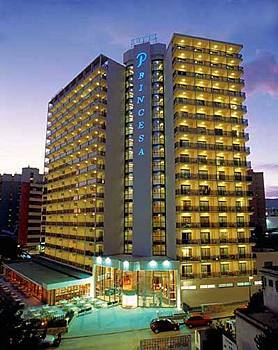 The 226 roomed hotel is only 460 yards to the Levante Beach makes the Hotel Princesa an ideal choice for your holiday in Benidorm. The hotel offers restaurants, cafes and bars which are all within a few steps of the hotel's entrance. Rooms are complete with either 2 or 3 beds, television, telephone, minibar, hairdryer, safety deposit box, air-conditioning and balcony.